Harry The Librarian: Public Libraries: More stress than safety in this workplace. "In the interest of full disclosure, a follow-up article revealed it was "only" a pellet gun stashed in the stacks..."
WORCESTER - Police dropped a firearm charge against a Worcester man after determining that the gun the suspect allegedly stashed on a bookshelf at the public library at Salem Square Friday was actually a pellet gun. Luis Bermudez, 24, of 17 Chandler St., Apt. 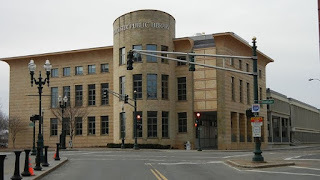 3, was arrested Friday after an off-duty Boston police officer said he saw Mr. Bermudez at Main and Chatham streets with a handgun in his waistband, and followed him to the Worcester Public Library. Worcester police were notified and officers found the suspect at a computer in the library. After reviewing surveillance footage, officers said they discovered that Mr. Bermudez had placed what was believed to have been a firearm on a bookshelf in one of the library aisles. Police recovered the suspected firearm and charged Mr. Bermudez with carrying a firearm without a license, after determining he did not have a firearm identification card or a license to carry. Mr. Bermudez was also charged with disorderly conduct. In a statement of facts filed in Central District Court by police prior to Mr. Bermudez' arraignment Monday, police said the gun that was recovered turned out to be a pellet gun. Mr. Bermudez was arraigned on the disorderly conduct charge and was released on personal recognizance by Judge Paul L. McGill, who continued his case to Oct. 2.